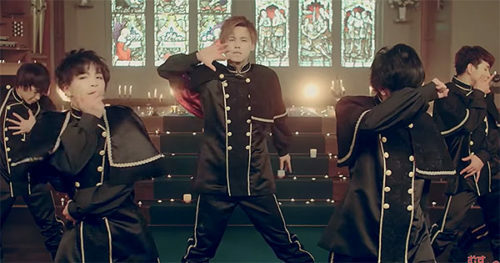 You don’t have to be a fan of MeseMoa to enjoy the music video for the Japanese boy band’s song, “Shadow Kiss.” You can even hit the mute button, if you prefer, just to focus on the dozens of kisses these five singers exchange over 4 long, wet, scintillating minutes. There are in fact 36 liplocks in all, as NewNowNext pointed out, and they seem to kiss even more than they sing and dance. But they do dance. And then they kiss some more, wearing what appears to be religious outfits, inside a church, no less.